If you are anything like me, you want to protect your pets from fleas and ticks and the diseases or illnesses that they may carry or cause. Personally, I believe ticks and Lyme disease are by far the scariest of these diseases. But, just because I’m afraid of one disease, doesn’t mean I’m willing to use a topical pesticide or internal medication that carries a risk of seizures, cardiac arrest, liver and kidney toxicity, convulsions, or even death. In my opinion, this risk doesn’t make sense where there are more natural tick and flea remedies available. 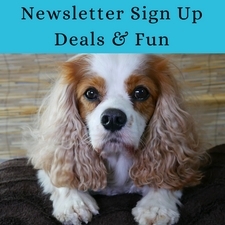 Over the years, I have tried and reviewed various all-natural tick and flea products, remedies, and DIY recipes. One of the biggest things I’ve learned over the years, is that not every solution meets every pet parent’s needs or goals. 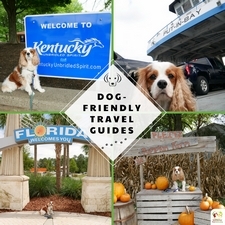 One example is that a natural flea and tick spray typically needs to be applied before each outside outing. This alone, may make a product fail due to human application error. 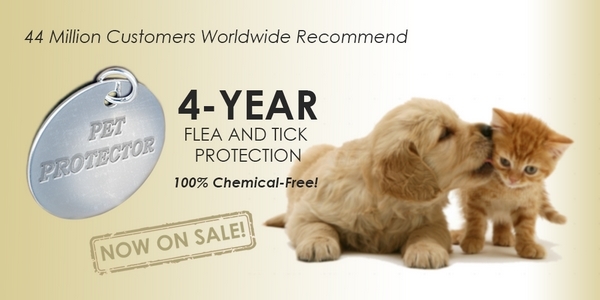 When the good folks at Goldstar Company approached me about their Pet Protector Flea and Tick Tag, I was intrigued. 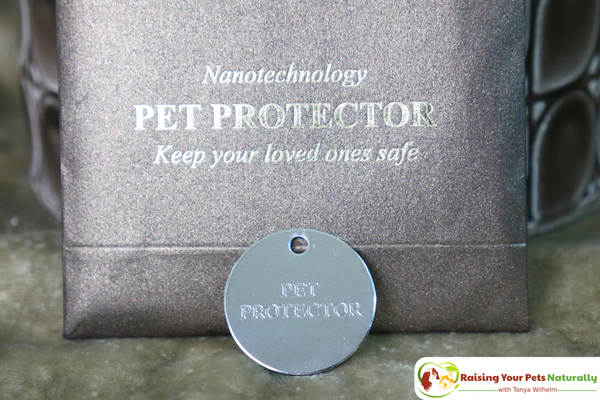 The Pet Protector Disc uses magnetic and scalar waves, creating a protective shield around the pet’s body. In turn, this field acts as a barrier and naturally repels parasites such as fleas and ticks. Is this technology above my head? Yes. Does this sound a little bit like science fiction? You bet. However, those of us who believe in Traditional Chinese Medicine Theory realize that everything in life doesn’t follow strict science-based testing. Look at homeopathic medicine for example. Homeopathic remedies involve taking a natural extract and diluting that numerous times in succession (vigorous shaking). These remedies are so diluted that almost no molecules can be found. From a scientific viewpoint, the remedy shouldn’t work. But I’ve used them and know of many incidences where they do. The Pet Protector Tag has been tested for efficiency. Upon the completion of a 4-year study on dogs, cats, horses, and sheep, the Pet Protector Disc demonstrated an incredible 96.67% rate of efficiency. 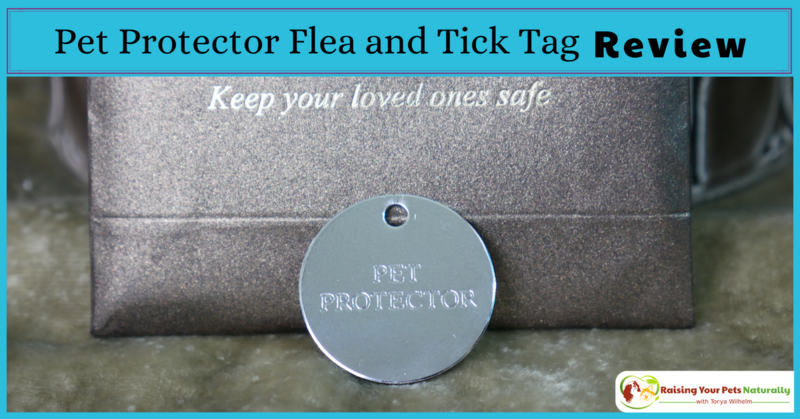 Unlike traditional and toxic flea and tick products, the Pet Protector Flea and Tick Tag is 100% chemical-free and safe. 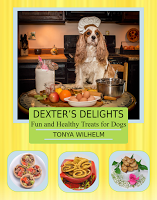 I was happy to accept this review and see how effective the product would be for Dexter. I try to go into everything with an open mind. 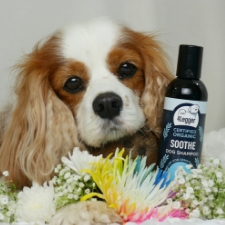 And by the way, I’ve heard good things about the Pet Protector in various holistic pet groups, so I knew others were having success with the product. 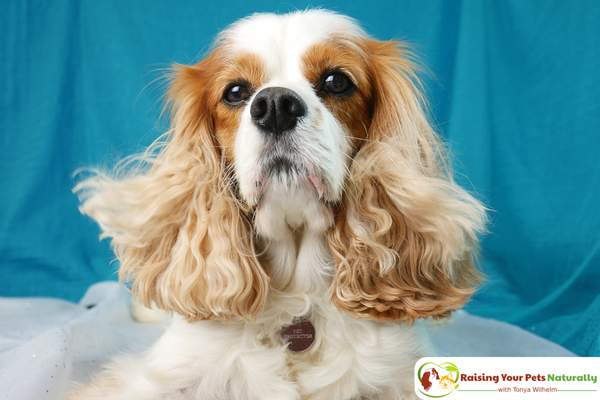 Your pet must be flea, tick, and pest-free prior to application. The Pet Protector Disc does not kill existing parasites. The Pet Protector Disc is about 1” in diameter. Simply attach the disk to your pet’s collar. It’s important to note, that your pet must keep his collar, i.e. the disk on 24/7 in order for the field to form. After attaching the disk to your pet’s collar, it takes approximately 7-20 days to form the protective field. During this time, use your natural flea and tick sprays and keep your pet away from any highly infected areas. If the disc is detached for more than two hours, another 7 to 20 days’ reactivation of the protective field is required. I think it’s important to note that I am not an advocate for leaving a pet’s collar on when unsupervised. This was one of the biggest challenges for me. I would highly recommend using something like a breakaway dog collar. A breakaway dog collar breaks open if there is pressure such as a foot getting caught up from scratching or hooked up in a crate. That said, do not attach your dog’s leash to his breakaway collar; please attach his leash to his walking harness. For Dexter, I used a light, soft, stretchy hair band to attach his disk. I decided to wait the 20 days before evaluating the effectiveness of the Pet Protector Disc. During this time, Dexter wore the tag 24/7, and I sprayed him with one of my DIY natural tick and flea sprays prior to going outside. 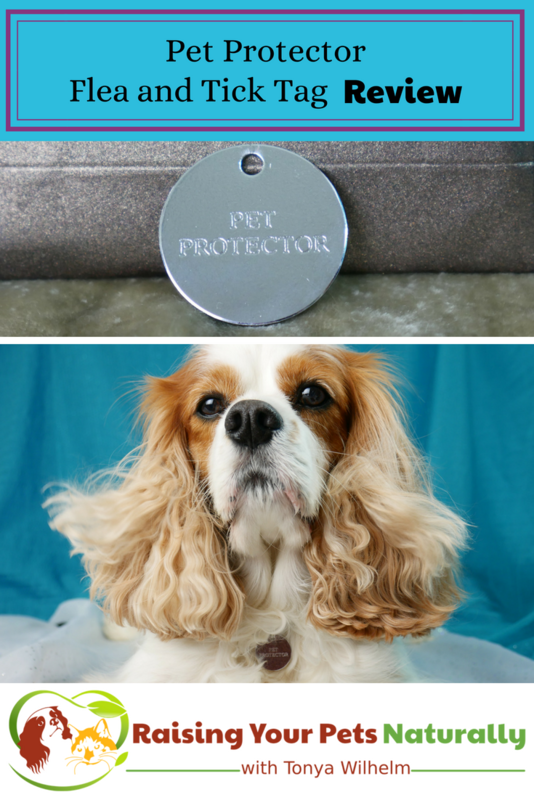 At day 21 I stopped spraying the spray and just relied on the Pet Protector Tag. Dexter was happy about this, as he hates being sprayed. 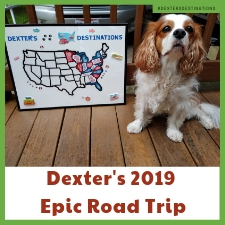 😉 Each evening, I thoroughly brushed and combed Dexter and looked for any signs of fleas or ticks. I am happy to report that after almost two weeks, Dexter continues to be flea and tick free. I will continue to check Dexter nightly for any runners. What I love about the Pet Protector Disc is that it’s a 100% chemical-free one-and-done application. There is no need to spray Dexter prior to each outing. The tags are completely water resistant and odorless. The company suggests the tags last up to 4 years. 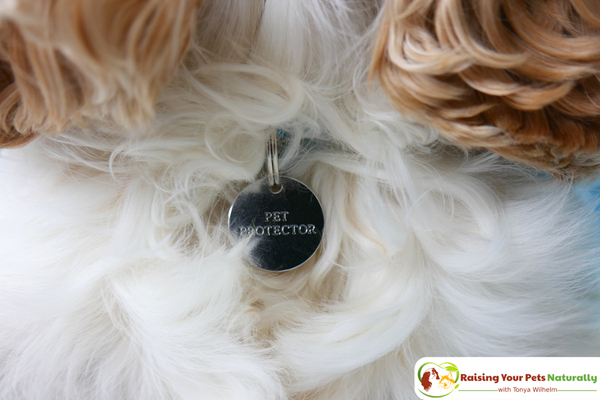 check out the Pet Protector Tag. Sale – buy2, get 3! Do you hate fleas and ticks? 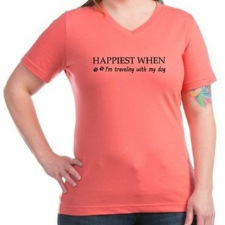 Tell me in the comments.